Over 115 guests from leading city businesses attended the latest Nottingham Partners event at the Hilton Hotel in Nottingham on Friday 11th January to hear talks from Councillor Jon Collins, the Leader of Nottingham City Council and Portfolio Holder for Regeneration and Growth, and Chris Henning, Corporate Director for Development and Growth, about the transformation happening in Nottingham. This sold-out event began with a welcome drinks reception, providing an invaluable opportunity for business networking amongst the attendees, who were able to meet up with like-minded businesspeople, making new acquaintances and catching up with business connections including those they had met at previous Nottingham Partners events, before enjoying a lunch provided by the Hilton. 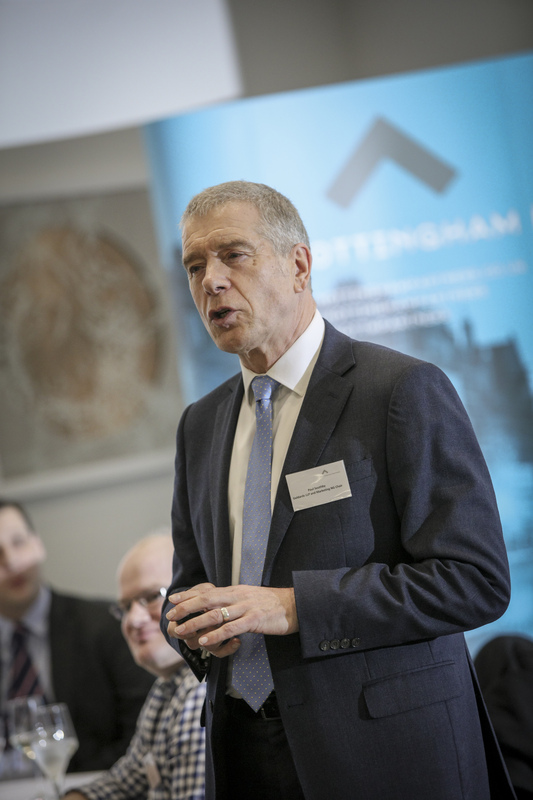 The talks were kicked off by Paul Southby, chairman of Marketing NG, who welcomed the audience to the new venue, introducing the special guests and new members of Nottingham Partners. His updates included the announcement of 4 new board members of Marketing NG, and he told the intrigued audience that at the end of the event, one lucky guest would find a golden envelope under their seat containing an overnight stay at the Hilton Hotel. 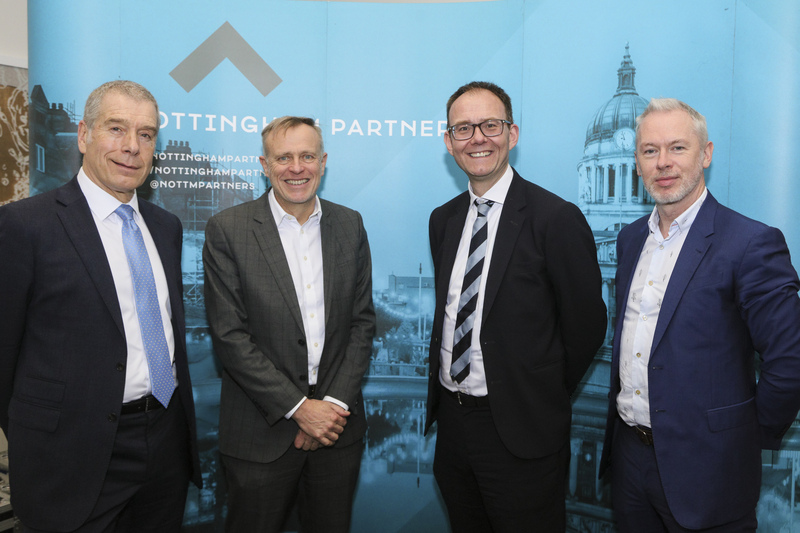 He then invited Jon Collins and Chris Henning to the stage to talk about the transformation that Nottingham is undergoing, including the journey so far, the current works underway and their future ambitions for the city. This information – which is promoted by Invest in Nottingham and shared with investors, developers and occupiers at events such as MIPIM – provided a unique opportunity for Nottingham businesspeople to understand the bigger picture of the Southside transformation, and the positive impact it would have upon their own businesses. Chris began by highlighting the broader economic challenges facing cities UK-wide and globally, noting the slower global growth, tougher trading conditions, Brexit, and the challenges of online retail. Having described the economic context, Chris expressed the importance of investing in our cities in order to promote growth. 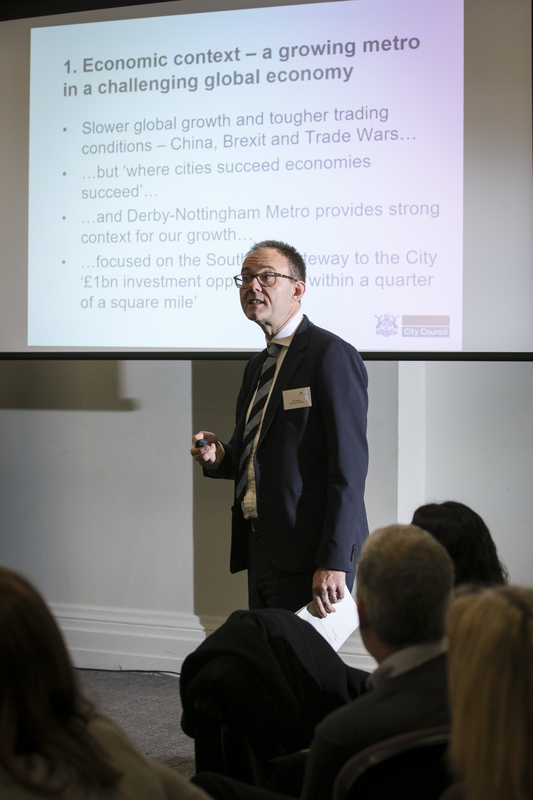 Nottingham City Council’s growth strategy, he explained, has been ambitiously and intelligently designed to allow Nottingham to thrive throughout this challenging period and in the future. They have analysed the most successful elements of other cities and incorporated these into their vision for Nottingham, and estimate that the Broadmarsh regeneration will boost Nottingham up the UK rankings to become the 5th best UK shopping area outside London. The works will strengthen Nottingham’s identity as a well-connected world-class destination for shopping, culture and events, centred around the Castle and Old Market Square. He explained some of the concrete actions they are taking to achieve this aspiration, before handing over to Jon Collins. 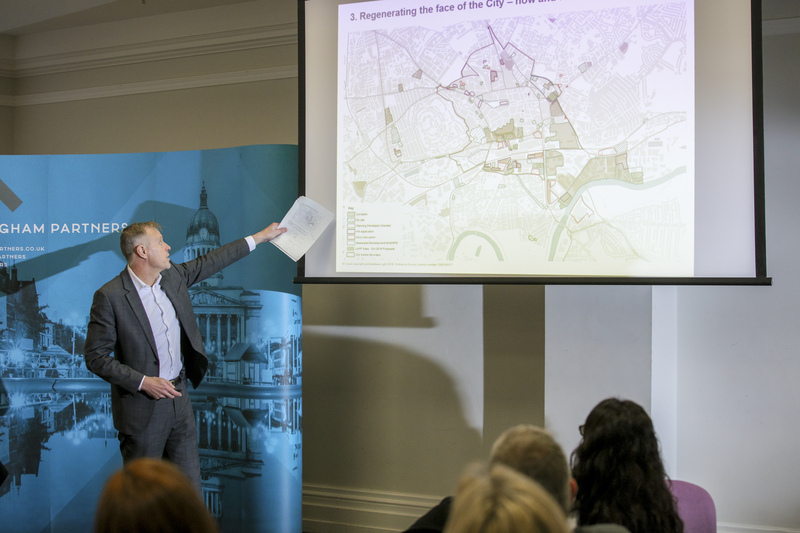 Jon presented a map of the developments in Nottingham, highlighting those which have been completed, those which are underway and others in various earlier stages of planning – demonstrating the huge scale of the transformation planned for the city. He described the different retail areas, contrasting the high street retailers in the north and south with the creative independents to the east and west in areas such as Hockley, explaining how the planned developments will align with – and strengthen – the identities of these areas. Jon focused in on the Southside – the most significant area of development planned for the city – recalling the struggles the area has faced in the past to put the planned works into context. He spoke about the new central library, which they hope will be the best children’s library in the country, and explained how all of the new facilities will generate footfall, activity, and interest in the area. The close proximity of the developments would boost inward investment and the additional Grade A office space would be a huge bonus for the city. Paul Southby brought the event to a close by identifying the lucky winner of the overnight stay at the Hilton and sharing details of upcoming Nottingham Partners events. The next event is the Nottingham Partners Annual Dinner on Thursday 31st January 2019. This is being sponsored by Eversheds Sutherland LLP and hosted at the Crowne Plaza Hotel in Nottingham. Tables of 10 are on sale at a cost of £500 + vat or individual tickets can be purchased at a cost of £60 + vat. Please email Natalie Williams (natalie.williams@nottinghampartners.co.uk) with your requirements. 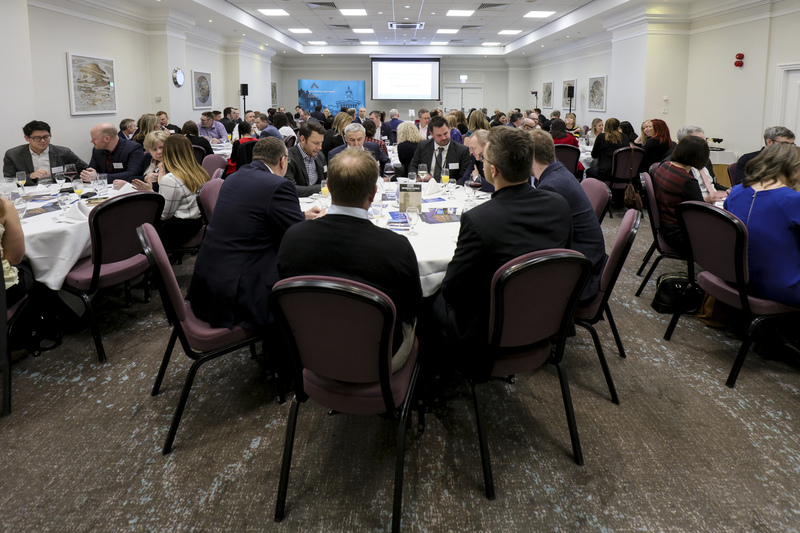 We have a great calendar of events lined up for 2019 and there’s never been a better time to find out more about Nottingham’s premier network. Contact Annette Thornley, our Commercial Partnerships Manager for more information at annette.thornley@nottinghampartners.co.uk or 0115 962 8311.